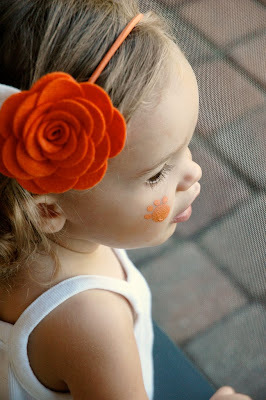 Clemson Girl: Tadpole and Lily Clemson Headband Giveaway Winner! Tadpole and Lily Clemson Headband Giveaway Winner! Earlier today we introduced you to the adorable, custom headband store, Tadpole and Lily. They offer handmade headbands in seven seasonal colors and two different petal styles. Tadpole and Lily was so sweet to giveaway one of their Clemson colored headbands to a lucky Clemson Girl reader. We compiled all of the entries and randomly drew a winner. Congrats Melissa!! Please email us at clemsongirlblog@gmail.com to claim your prize. Let us know if you'd like a girl/adult size headband or an infant sized headband and what style flower you'd like --> scalloped-edge petal OR a rounded-edge petal. Thanks to everyone who entered today! Ladies, if you didn't win today, you can still order your own custom Tadpole and Lily headband online using their website. Special thanks to Tadpole & Lily for sponsoring today's giveaway!